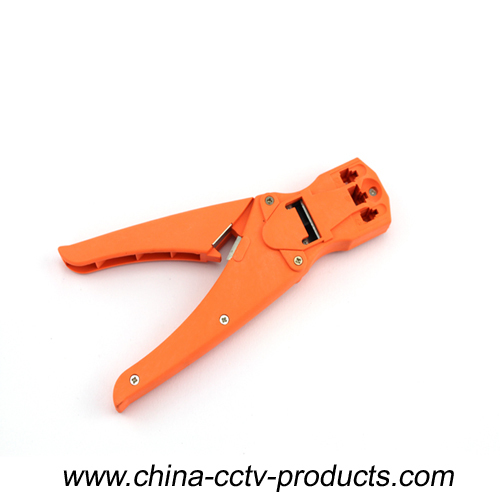 Modular plug stripping tool, network stripping tool and modular plug stripping tool for RJ45 RJ12 RJ11, coaxial cable, Fiber, as network accessories parts. 1. Insert cable between stripper blades. 1a. Insert 4P/6P/8P cable from the top end of the stripper until it touches the stop guide (stripping length 6mm). 1b. Insert 8P cable between stripper blades and let it extend a little past the lower cut blade. 2. Squeeze handles until it stops, cable must be kept perpendicular and then pull from the tool. Insert the cable into the round stripping hole, turn the crimper in counter clockwise direction and cable in clockwise at the same time. 4. Remove the outer jacket, insert the stripped cable into the plug and be sure the left wire at one end matches the right wire at the other end. 5. Place modular plug with cable into the tool's holder. Make sure the stripped wire is between the tab and gold contacts. Squeeze handles until it stops. 6. Remove the crimped plug from the tool. 7. During the crimping process, you may turn the screw on the ratchet in counterclockwise direction to stop the incorrect operation. 8. To crimp "DEC" plug, follow step 1 to step 3. Remove the screw on the left side of the 6P holder, insert the "DEC" plug and cable into the 6P holder and squeeze handles till it stops. It has three crimping pliers. It can be used for 4P, 6P, 8P crystal head crimping. Make by Plastic,easy and convenient.